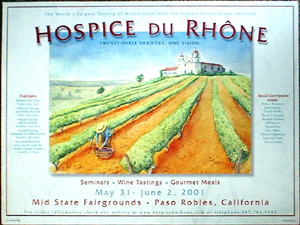 Billed as the largest Rhone wine tasting event in the world, Seal created this original watercolor for their poster. Originally painted of the Rhone Valley with a French chateau on the hill, promoters decided it needed to be "more California". Seal repainted a new identical painting substituting Mission Santa Barabara for the chateau.